The Most Reverend Vincent Nichols, Archbishop of Westminster, today received the Pallium from Pope Benedict XVI in Rome on the feast of Saints Peter and Paul, Monday 29 June 2009. The use of the Pallium among metropolitans did not become general until the ninth century, when the obligation was laid upon all Western metropolitans of forwarding a petition for the Pallium accompanied by a solemn profession of faith, all consecrations forbidden them before the reception of the Pallium. The aim of this rule was to bring the metropolitans into more intimate connection with the Holy See. Worn by the pope, the Pallium symbolizes the plenitudo pontificalis officii (i.e., the 'plenitude of pontifical office'); worn by archbishops, it typifies their participation in the supreme pastoral power of the pope, who concedes it to them for their proper church provinces. 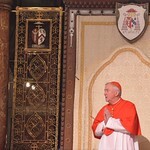 Similarly, after his resignation, he may not use the Pallium; should he be transferred to another archdiocese, he must again petition the Holy Father for a new Pallium. The new Pallia are solemnly blessed after the Second Vespers on the feast of Saints Peter and Paul, and are then kept in a special silver-gilt casket near the tomb of St. Peter until required.